In our recent studies of Arizona, we learned briefly about some of the butterflies that live here (or stop by for a visit). I thought it would be a wonderful experience to see some up close and watch them go through the process of metamorphosis. I have wanted to do this with the kids for quite some time, but would have really preferred finding some in our yard to bring in and study. Unfortunately, no luck! So I decided to try my hand at ordering some. We decided to go with Carolina Biological so we could get a few other fun items too. We ordered a cup of 5 caterpillars (we ended up receiving 6), a Mallow plant, Mantis egg cases, and some mosses (for my vivariums). We also would have liked to order some Luna Moth cocoons, however they are not allowed to be sent to our state. There is a butterfly farm that offers up to 12 eggs free, you just pay shipping, that we may try if we decide to do this again. Also, I saw a butterfly kit at Walmart for about $15 that includes a coupon for five live caterpillars. I would assume you have to pay shipping on those, but it does come with a little pop-up habitat for keeping the butterflies. Our order from Carolina Biological arrived just a few days after the order was placed. The little caterpillars were absolutely tiny, just about half an inch long! After oohing and ahhing over them for a few moments, we set them aside and paid quite a bit more attention to the silkworm project we had also started, our visiting relative, and spring break activities. We were quite amazed when we checked back in on them a few days later and they had grown huge (well, an inch and a half huge). I was a little bummed because I had not had a chance to snap any pictures of the little caterpillars, so I grabbed the camera, found a place to plug it in (yes, plug it in – it gobbles batteries faster than my kids can start a fight with each other), and did my best to capture it on digital film. The little caterpillar had other ideas though. It did NOT want to stay in one place and pose nicely. Caterpillars 1 week after arrival, just before making a chrysalis. Noah was thoroughly disgusted when the caterpillar deposited a mess of orange goo on him. After his photo shoot, the little guy was returned to his home. I worried for a little bit that the amount of food left in the container was not nearly enough to see them through to adults. Would I have to rush out and try to find more Mallow plants? Would I be able to find another host plant? Or would I have to sacrifice some so that some would survive? I didn’t have long to worry. When I checked in on them later, two were sleeping upside down in a J shape. I knew that they were getting ready to cocoon. Sure enough, by the next morning, they were sleeping in their little houses, all snug and cozy. 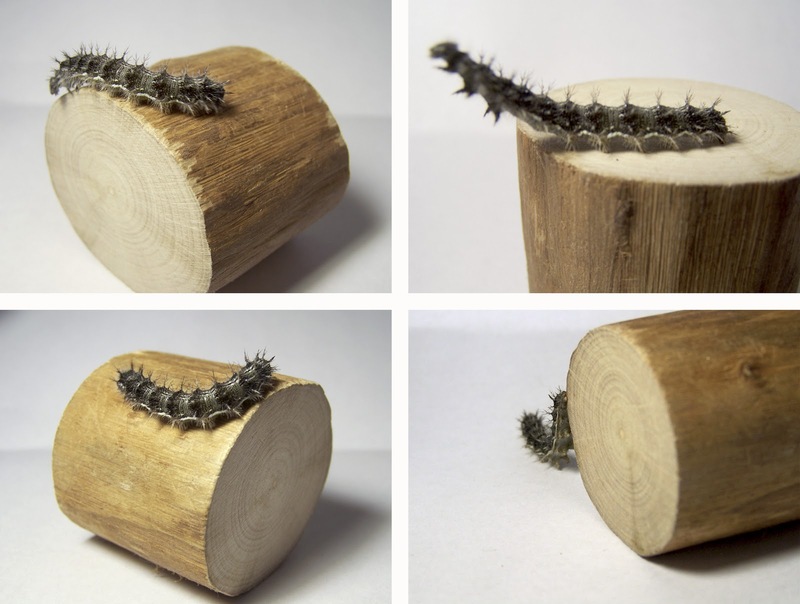 The other four caterpillars were crawling all over the place, and looking like they were going to start their own cocoons. In the process, they must have knocked down one of the cocoons, because it was on the bottom of the container when I next looked. I quickly googled it and discovered that you can carefully use a dab of hot glue to re-attach them, making sure not to burn them at all. So I made my little dab of glue on a lid of a different container, let it cool for a moment, and tried to pick up the cocoon. I was surprised at how much they can wriggle around! I was expecting a very hard, shell-like substance, but it just felt like an insect body. After a couple of failed attempts, we were finally able to get the poor guy hanging back up. The rest of the caterpillars settled down and made their cocoons. 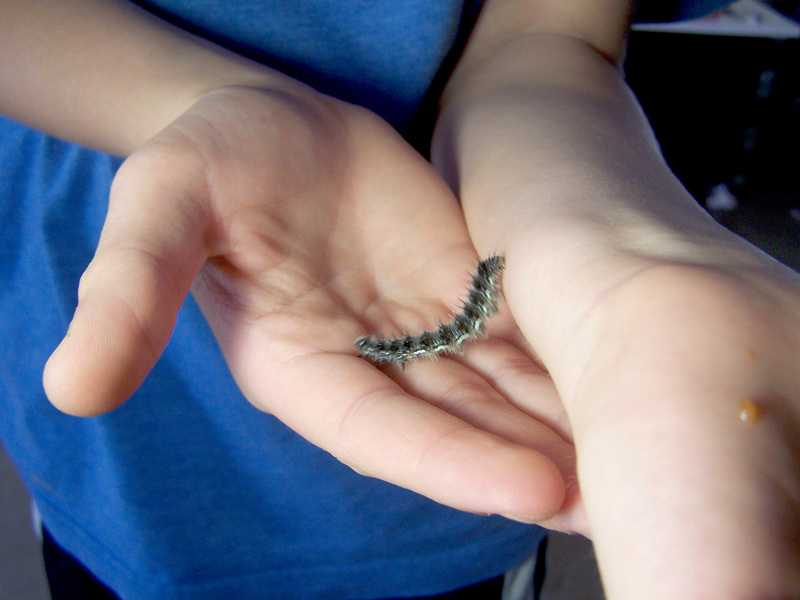 We had only had the caterpillars for 8 days at this point. The whole process was moving a little faster than I had anticipated. I had been planning on setting up a big wonderful habitat for the butterflies, but was running out of time! To make matters worse, the silkworm eggs that I had bought (this will be another post!) had hatched and were growing quickly and required quite a bit of care, and I still hadn’t done anything with the Mantises (at least I had 4 to 6 weeks before those hatched according to the container they arrived in). So I quickly threw together an old 29 gallon tank turned up on end for the habitat. I potted some flowers, added the mallow that we had bought, as well as some that we were able to find around our yard (one benefit of running behind on pulling weeds!). Unfortunately, the tank has hard water deposits on it that I did not have time to scrape and soak away as I would have liked. Oh well! I busily finished up the tank yesterday, and carefully glued the little cocoons onto branches (the tissue pieces they were attached to, not the cocoons themselves). We watched as one became very agitated at being disturbed. It wriggled and jiggled on the branch before settling back down. 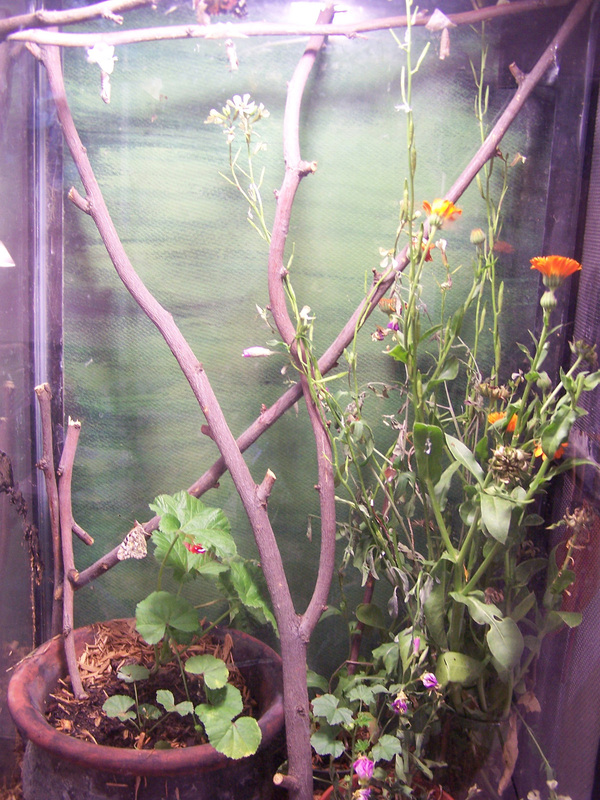 The butterfly habitat - you may just be able to make out the cocoons hanging from branches at the top, as well as a couple of new butterflies drying their wings (one at the very top, and one just above the pot on a branch). Early this morning, when I took the big kid off to track practice, the cocoons were all still hanging peacefully. Just a few hours later, three of the butterflies had emerged! They are amazing with their muted colors on the underside of the wings, and the brilliant orange on the tops. I did my best to get some pictures, but between a full memory card, and the not-quite-clean glass, I was having a difficult time. I hope to post a few more soon! This has been such a wonderful project. I was really not expecting it to go so smoothly. I am thrilled that three of the caterpillars so far have emerged into beautiful butterflies. We are going to hope that they lay some eggs now and we can see the life cycle along even farther! Newly emerged butterfly clinging to the tissue that it's cocoon is attached to. Notice the red fluid (meconium) that the butterflies expel after emerging? It's on a Mallow leaf. Right behind the leaf, on a branch, is one of the butterflies. It's very hard to see! Wow! I am grateful for the abundance of life on this earth, but it's easy to get complacent. Photos like these bring me back to the wonder. Thanks for posting them. we just did this too!!!! nature up-close is so cool! this is super awesome! 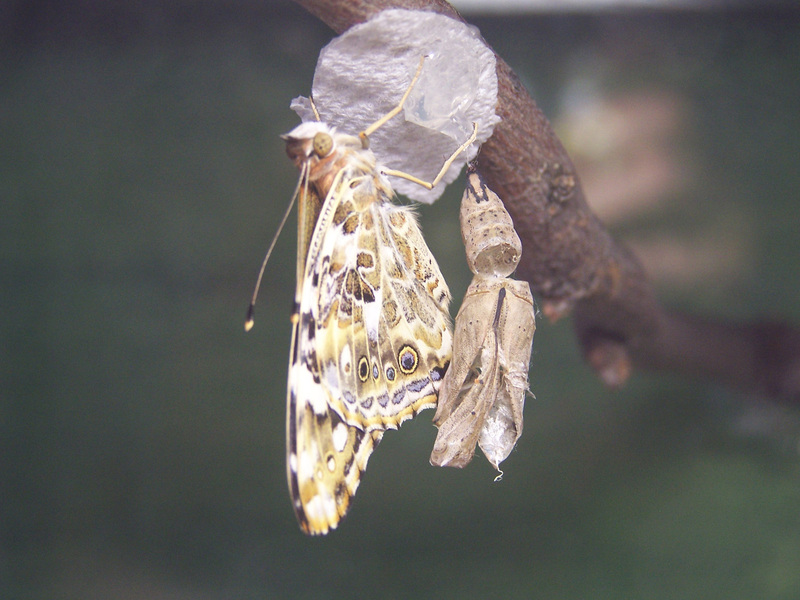 we’re waiting on our caterpillars to arrive for our butterfly kit–can’t wait. I had no idea you could order them by the cup! This was really a great activity! We were able to get eggs from ours and now have almost 40 butterflies that are now all laying eggs. So amazing to experience!